(Cited in “Tarjuman-e-Ahl-e-Sunnat”, Khi, December, 1975). Nobody between his generations was as effective as to dominate the plurality of Muslim Ummah of Pak-Indo Sub-continent all apart from North to south and from East to West. A just Philosopher is the perception and voice of his people and an Islamic Philosopher whose support or logic is the holy Quran and the Sunnah of the holy Prophet (صَلَّی اللہُ تَعَالٰی عَلَیْہِ وَاٰلِہٖ وَسَلَّمَ) and is the observer of science and the announcer of truth, justice and the donor of humankind. It will not be UN realistic if I say that Moulana Ahmad Raza Khan (رَحْمَۃُ اللہِ تَعَالٰی عَلَیْہِ) was a philosopher of the very type. Professor Dr. Muhammad Qaiser the vise –chancellor of Karachi University states: More than (50) P.H.D degrees were accomplished on Hazrat Ahmed Raza Khan (رَحْمَۃُ اللہِ تَعَالٰی عَلَیْہِ) on Sunday, May 26, 2013 in Karachi Pakistan. Articles from his books are also included in the syllabus of Karachi University books. His Highness Sheikh Abdullah Madani of Madina-e-Munawarah stated: “Research work on Hazrat Ahmad Raza Khan (رَحْمَۃُ اللہِ تَعَالٰی عَلَیْہِ) is in evolution throughout the Real Arab world”. Dr. Abdul Nabi Hameedi of South Africa called for betterment of the teachings of Hazrat Ahmad Raza (رَحْمَۃُ اللہِ تَعَالٰی عَلَیْہِ) for the well-being of harmony and peace. “All Glory is for Almighty Allah (عَزَّوَجَلَّ) who is the only creator. I have examined closely of this brilliant and apparent book. Our pioneer and utmost experienced Ocean of extreme Knowledge, Hazrat Ahmed Raza Khan (رَحْمَۃُ اللہِ تَعَالٰی عَلَیْہِ) has made visible the errors of those who have come out of hideaway, those who walk on the direction of the nonbelievers and the vicious ones, in his absolute book “Al Mu’tamadul Mustanad.” From between their dishonest faith, he did not leave anyone un-expressed. Dear Intellectuals, it is necessary for you to hold on to this very “Book” which its writer has composed with extreme velocity. You will find in this very book radiant and apparent picture in counter of these bodies. Principally those bodies who determine to reveal the impartial which is previously obligated. “May Almighty Allah (عَزَّوَجَلَّ) award Hazrat Ahmed Raza Khan (رَحْمَۃُ اللہِ تَعَالٰی عَلَیْہِ) huge compensation for he has given remedy and has explained his directives which are in his very book, “Al Mu’tamadul Mustanad”, in which are also the mandate of the “Ullamah” of Makkah-tul-Mukarramah and Madina-tul-Munawarah . Because of the misdeed and anxiety it has become essential for them as they (the misguided) are extending misdeeds on this planet and all those on their course. “The educated man on this planet, the Ocean of huge intelligence, the serenity of the eyes of the Ulema-e-Haq, is Moulana Hazrat Ahmed Raza Khan (رَحْمَۃُ اللہِ تَعَالٰی عَلَیْہِ). Hazrat Ahmed Raza Khan (رَحْمَۃُ اللہِ تَعَالٰی عَلَیْہِ) used plenty of his treasured life scripting Poetry. His scripts mostly existed of Praise “Naat-Shareef” for the holy Prophet (صَلَّی اللہُ تَعَالٰی عَلَیْہِ وَاٰلِہٖ وَسَلَّمَ) and Praise “Manqabats” for the friends of Almighty Allah (عَزَّوَجَلَّ). It is apparent that his emotions and spirit was fallen in love with the holy Prophet (صَلَّی اللہُ تَعَالٰی عَلَیْہِ وَاٰلِہٖ وَسَلَّمَ) and is scripted within the horizon of “Shariah” and each “Verse” is filled with “Gems” of (Elhaam). (“Elhaam” is message which is stimulated by Almighty Allah (عَزَّوَجَلَّ) into the hearts of “Auliya” the friends of Almighty Allah (عَزَّوَجَلَّ). Just as the Prophets receive “Wahi” or Epiphany, the “Auliya” receive “Elhaam”.) His Poetry is basically the analysis of the verses of the holy Qur’an and the Hadith of the holy prophet (صَلَّی اللہُ تَعَالٰی عَلَیْہِ وَاٰلِہٖ وَسَلَّمَ) and is largely in the Persian, Arabic and Urdu language. It is an incident during Ala Hazrat’s probably second visit to Madina-Munawarah that his desire to see the holy Prophet (صَلَّی اللہُ تَعَالٰی عَلَیْہِ وَاٰلِہٖ وَسَلَّمَ) became exceptionally immense. Constantly narrating “Durood” with extreme devotion and innocence in front of the Golden-grills of the holy Prophet (صَلَّی اللہُ تَعَالٰی عَلَیْہِ وَاٰلِہٖ وَسَلَّمَ), he was confident within himself of witnessing the holy Prophet (صَلَّی اللہُ تَعَالٰی عَلَیْہِ وَاٰلِہٖ وَسَلَّمَ) physically. It was the second night of his visit at the doorstep of His Highness the holy prophet (صَلَّی اللہُ تَعَالٰی عَلَیْہِ وَاٰلِہٖ وَسَلَّمَ) and suddenly he was blessed with the opportunity to see the sanctified beauty of our dearest Prophet (صَلَّی اللہُ تَعَالٰی عَلَیْہِ وَاٰلِہٖ وَسَلَّمَ). Hazrat Ahmed Raza Khan (رَحْمَۃُ اللہِ تَعَالٰی عَلَیْہِ) floored himself in severe loyalty and humbleness, and addressed himself as a “dog” of the sanctified Prophet (صَلَّی اللہُ تَعَالٰی عَلَیْہِ وَاٰلِہٖ وَسَلَّمَ). At that moment, he was given the moment of seeing with his very own eyes, the sanctified personality of the holy Prophet (صَلَّی اللہُ تَعَالٰی عَلَیْہِ وَاٰلِہٖ وَسَلَّمَ) standing next to the Golden-Grill! At the age of 13 years, 10 months and 4 days, after learning the common sciences relying on the supervision of his honored father Moulana Naqi Ali Khan (رَحْمَةُ الله عَلَيْه) a “Dastar” (achievements in Islamic research) was rewarded to Ala Hazrat (رَحْمَةُ الله عَلَيْه). On that particular day, he created a “Fatwa” and forwarded it to his honorable father Moulana Naqi Ali Khan (رَحْمَةُ الله عَلَيْه) who inspected it and it was completely accurate. Apprehending to the skills of his beloved son, Moulana Naqi Ali Khan (رَحْمَةُ الله عَلَيْه) sanctioned Ala Hazrat (رَحْمَةُ الله عَلَيْه) to uphold the position of a “Mufti” and Ala Hazrat (رَحْمَةُ الله عَلَيْه) persisted this until the limit. 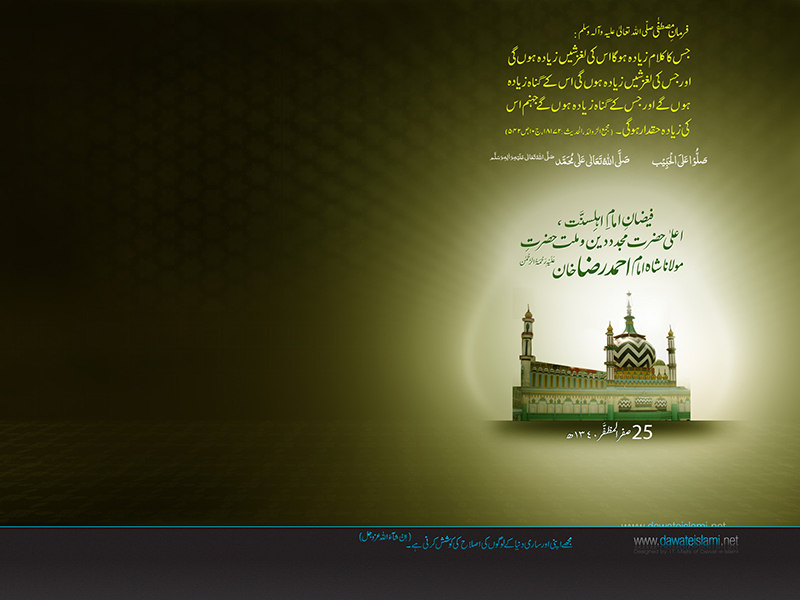 Almighty Allah (عَزَّوَجَل) sanctified Ala Hazrat (رَحْمَةُ الله عَلَيْه) with abilities of distinct wisdoms. Ahmed Raza Khan (رَحْمَةُ الله عَلَيْه) wrote on more than (50) various sections of wisdoms and was a proficient in each every distinct wisdom. Ahmed Raza Khan (رَحْمَةُ الله عَلَيْه) was such an experienced stargazer and visionary that he (رَحْمَةُ الله عَلَيْه) would adjust his timepiece just by examining the sun in the daytime and the stars at nighttime. The time he determined was regularly exact and correct with not even a moment’s difference. Ala Hazrat (رَحْمَةُ الله عَلَيْه) was also an excellent and wonderful Mathematician. Earlier the vice President of Aligarh University, a superior Mathematician and heritor of various worldwide degrees, came to Ahmad Raza Khan (رَحْمَةُ الله عَلَيْه). He shyly exposed the complication of the question but to his state of surprise Ahmad Raza Khan ( رَحْمَةُ الله عَلَيْه )answered the question instantly!, he proclaimed, My plan was to travel to Germany for the answer but it seems as if you were vigilant to the answer of this question in a book. When he returned the impact of this action, he raised a beard and became careful in performing Salah and fasting. When people surrendered in finding the related references for Fiqh, they went to Ala Hazrat (رَحْمَةُ الله عَلَيْه) who presented the right answers instantly. When these books were explored, they would find the verses or verdict written exactly as Ala Hazrat (رَحْمَةُ الله عَلَيْه) had stated. We can only say that this is surely Almighty Allah’s (عَزَّوَجَل) gifted rare recall, that he even remembered the most aged books by heart. Sayed Ayub Ali ( رَحْمَةُ الله عَلَيْه )states that one day Ala Hazrat ( رَحْمَةُ الله عَلَيْه )said, Some people who are unaware have written the title of Hafiz before my name even though I am not worthy of this title because I have not memorized the Quran. Sayed Ayub (رَحْمَةُ الله عَلَيْه) states that on the same day, Ala Hazrat (رَحْمَةُ الله عَلَيْه) started memorizing the holy Quran. His everyday habitual was most apparently from after he performed his “Wuzu” for (Esha-prayers) until the last time of (Esha-prayers). Ala Hazrat (رَحْمَةُ الله عَلَيْه) memorized one Para (chapter) of the holy Quran each day and completed the 30th Para (chapters) on the 30th day. Ala Hazrat (رَحْمَةُ الله عَلَيْه) was a symbol of affection and love for the holy Prophet (صَلَّى اللهُ تَعَالٰى عَلَيْه وَاٰله وَسَلَّم). The love that Ala Hazrat (رَحْمَةُ الله عَلَيْه) had for the holy Prophet (صَلَّى اللهُ تَعَالٰى عَلَيْه وَاٰله وَسَلَّم) can be widely recognized by reading “Hadaaiq-e-Baksheesh”, in which very line of every page is evidence of Ala Hazrat’s (رَحْمَةُ الله عَلَيْه) love and affection towards the holy Prophet (صَلَّى اللهُ تَعَالٰى عَلَيْه وَاٰله وَسَلَّم). Every single verse which he( رَحْمَةُ الله عَلَيْه )has phrased the holy Prophet( صَلَّى اللهُ تَعَالٰى عَلَيْه وَاٰله وَسَلَّم )from the intensity of his heart, declares to his boundless love & adoration for the holy Prophet( صَلَّى اللهُ تَعَالٰى عَلَيْه وَاٰله وَسَلَّم). Ala Hazrat (رَحْمَةُ الله عَلَيْه) never ever wrote complementary poetry in devotion of an essential or a ruler to impress or satisfy them, because Ala Hazrat (رَحْمَةُ الله عَلَيْه) had genuinely approved the thralldom, and reverence towards the holy Prophet (صَلَّى اللهُ تَعَالٰى عَلَيْه وَاٰله وَسَلَّم). Ala Hazrat (رَحْمَةُ الله عَلَيْه) never addressed poor with disappointment and never dispatched those empty handed. He (رَحْمَةُ الله عَلَيْه) always aided the meager and deprived. Before his demise, he (رَحْمَةُ الله عَلَيْه) advised his companions and members of the family to attend the needy, delight them by nourishing them with luscious food and do not chastise or abuse them. He (رَحْمَةُ الله عَلَيْه) always performed “Salah” (Prayers) with “Jamaat” and consumed very little meal, and did not slumber more than approximately two hours in a day. Ahmed Raza Khan (رَحْمَةُ الله عَلَيْه) was on a visit to “Bareilly” in a train from “Peeli-Bheet”. During the trip, the train halted at “Nawab-Ganj” platform for a few moments. Ahmed Raza Khan (رَحْمَةُ الله عَلَيْه) with his associates came onto the platform to offer their “Magrib-Prayers. The associates were anxious the train may depart barring them, but Ahmed Raza Khan (رَحْمَةُ الله عَلَيْه) stayed very quiet and requested one of his associates to proclaim “Azaan”. In the meantime, the train-driver was engaged mysteriously in difficulties in starting the locomotive, the locomotive would not maneuver. All the engineers along with the superior officials of the platform assembled together to see what basically was the problem. “The engine is perfectly ok the driver proclaimed” abruptly a Pundit (Hindu priest) exclaimed, “A Darvesh is supplicating, maybe that is why the train is not maneuvering”. People surrounded Ala Hazrat (رَحْمَةُ الله عَلَيْه) and as he finished supplicating and embarked the locomotive along with his associates the locomotive started maneuvering. It’s correct that one who is loyal and obedient to Almighty Allah (عَزَّوَجَل) the complete world becomes obedient to him. Hazrat Ahmed Raza Khan (رَحْمَةُ الله عَلَيْه) has composed almost one thousand books and numerous “Fatawah” (Legal-Rulings) unluckily they have completely not been recovered and those recovered are entitled as (Alata yan nabawiyah fil Fataawah Radawiyyah). He has also translated the holy Quran in Urdu which is called Kanzul-Imaan. On the 25th of Safarul Muzaffar 1340 (28th October Friday 1921), at exactly 2:38 pm. Ala Hazrat (رَحْمَةُ الله عَلَيْه) Imam-e-Ahle Sunnah, Mujaddid of the Muslim Ummah, motivator of the Sunnah, teacher of Shariah, mentor of Tariqah, source of blessing, Allama Moulana Muhammad Ahmed Raza Khan (رَحْمَةُ الله عَلَيْه) passed away from this colorless journey (اِنَّا لِلّهِ وَاِنَّآ اِلَيْهِ رَاجِعُوْن). The sanctified shrine of Hazrat Ahmed Raza Khan (رَحْمَةُ الله عَلَيْه) is located in Mohallah Soudagaran, Bareelly Shareef in (UP) India.